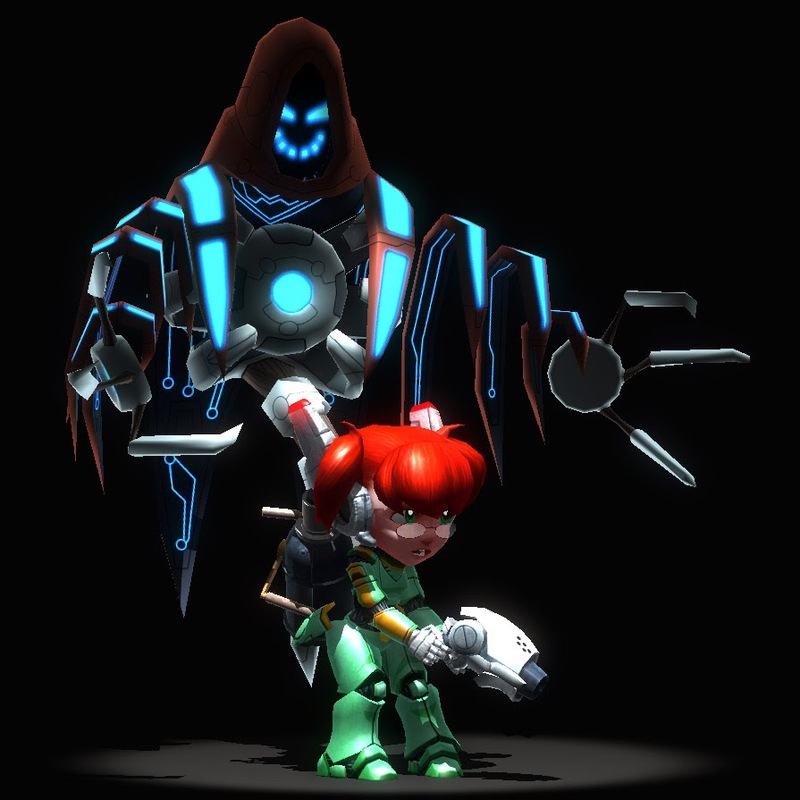 Assault Android Cactus: But what do they do? Yesterday I revealed a work in progress of the next enemy type on Twitter, and it prompted some questions. The main question being "... he's right behind me isn't he?" to which the answer is "Probably! He can teleport! Being behind you is kind of his thing!" and the other question was "what possible role could THAT have had on the Genki Star prior to that pesky robot uprising?" The second question sort of got me wondering though, was there this level of confusion about the other robots? Keep in mind that the Genki Star is a civilian space freighter - sure it has to deal with security concerns just like any other large private facility but it doesn't exactly keep a standing army. The berserk robots are all regular service models that kept the ship running and have simply adapted the best they can to the goal of attacking everyone. It's actually kind of inspirational if you think about it. Anyway, I figured I'd go through the various robots Cactus is going to end up shooting and talk about their civilian application, just to clear up any confusion. The robots and their duties on board the AS Genki Star. Always a common sight on the lower decks. Trusty sure-footed workhorses, they can clamber over nearly every surface type and can carry many times their own weight. Marketed as "go anywhere do anything" they're the bread and butter of Embryo's worker force and are capable of hauling cargo, unpacking equipment and even performing simple maintenance tasks like changing their attachments. This type has changed it's attachment to a plasma rifle. I guess they did that after the uprising. No idea where they got the plasma rifles from. Hardy flying platforms able to haul equipment, Amazon deliveries and even other robots, drones are used in areas of the ship where ground access is difficult or dangerous. They've also managed to find where someone was keeping the plasma rifles. You'd think you wouldn't just leave them lying around where any robot could find them, but, hey! Here we are! the hulking behemoths of the lower decks, these robots normally never venture far from the heart of the ship where they are used to regulate pressure, reroute fluid systems and prop up heavy stuff. Able to generate and maintain pressure and heat within their mighty frames, they are occasionally invited to the crew decks for special events where they will roast and distribute chicken to everyone in attendance simultaneously, much to the delight of children and adults alike. Deployable both free floating in space and within the artificial gravity of the ship, they are self propelled target seeking mines capable of blowing a hole in the side of a small spaceship. Kept in stock as both a deterrent to space pirates and as general purpose demolition charge, someone apparently vastly overestimated the amount of stuff that would need blowing up because there sure seems to be a lot of these. Used in vermin control. You get rats in space, you know. Very adaptable creatures, rats, and quite intelligent. Have been known to weave their own spacesuits out of discarded pieces of cloth. Once during a special event a rat leap out of an air vent and snatched a roast chicken out of the air, much to the delight of children and adults alike. small, fast and able to traverse the upper cabins, these little robots are used extensively to ferry items around the ship. If someone needed their maintenance belt, a roll of tape or even left their sandwich at home, it'd be these little guys who'd bring it to them. Limited facial recognition meant they would regularly deliver their contents to unrelated strangers. cheaper, more agile and much more caffeinated than their larger brethren, Vespula relies on massive numbers of these machines to monitor and maintain the ship. Equipped with sharpened coat hooks in case anyone needs to hang up their coat. While primarily used to transport large numbers of dormant surveillance drones, these general purpose and highly manoeuvrable devices can be used to relocate small robots, delicate equipment, and on one memorable occasion - under the direction of the shuttle bay maintenance team - five hundred litres of butterscotch Schnapps. The shuttle bay rec room is currently off limits until further notice and there is now a strict "no liquids" rule on transport tank use. These large autonomous mini-factories create small single function drones on demand and are typically tasked with investigating and monitoring hazardous conditions, inspecting repairs and acting as communication relays. By extending their nodes they are able to create massive antennas and are used to create connections between teams when other forms of communication are difficult to maintain. I hope that's cleared up any and all confusion resulting to the civilian function of the various robots you'll encounter in the game!